There are still so many people that are completely unaware of the genetically engineered foods all around us. I wanted to provide a brief overview that may help others to understand the critical need for all of us to examine our family’s nutrition amidst the chaos of daily life. What is a GMO and why would it be in my food? A GMO, or genetically mutated organism, is scientifically altered changing the DNA of a plant or animal. Using genetic engineering, it’s possible for biotech companies to insert genes from various bacteria, viruses, and other resources, forcing them directly into a plant’s DNA. Once the gene is integrated into the DNA of a plant cell, the cell can be cloned into a complete plant. Although the biotech industry describes these processes as exact and scientific – the truth is that it’s very primitive and randomized. Such insertion of genes is often facilitated with the use of a gene gun, literally shooting the desired genes into a plate of cells. The process is rife with scientific uncertainty and risk. Today, the most commonly grown GM crops include soy, corn, cotton, and canola. Processed foods are full of variations of soy and corn ingredients. If you produce dinner from a packaged box off the grocery store shelf, there’s a high probability that the meal contains GMOs. If your favorite foods are produced by companies like General Mills, Pillsbury, Betty Crocker, and Campbell’s then it’s a pretty safe bet that you’re consuming genetically mutated organisms. So, What’s Wrong with GMOs Anyway? Didn’t the FDA Approve these Foods? Let’s travel back in time to the year 1992. 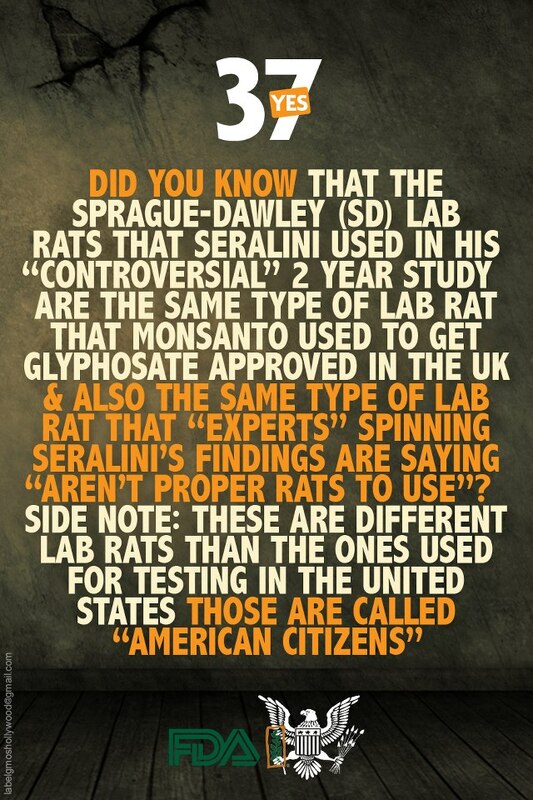 During this time, policy was being written for how the FDA would evaluate and regulate the release of GMO foods. Scientists at that time had some very powerful concerns and criticisms of policy in development. In fact, the general consensus among FDA scientists was that consuming these foods may lead to unexpected, difficult to detect side effects; including allergies, toxins, new diseases, and other nutritional concerns. Scientists at this time urged the agency to force longer-term studies regarding safety. The possibility of unexpected, accidental changes in genetically engineered plants justifies a limited traditional toxicological study. Increased levels of known naturally occurring toxins, appearance of new, not previously identified toxins, increased tendency to gather toxic substances from the environment and undesirable alterations in the levels of nutrients. By trying to force an ultimate conclusion that there is no difference between foods modified by genetic engineering and foods modified by traditional breeding practices, the agency was trying to fit a square peg into a round hole. There is no certainty that [breeders] will be able to pick up effects that might not be obvious. This is the industry’s pet idea, namely that there are no unintended effects that will raise the FDA’s level of concern. But time and time again, there is no data to back up their contention. What has happened to the scientific elements of this document? Without a sound scientific base to rest on, this becomes a broad, general, ‘What do I have to do to avoid trouble’-type document…It will look like and probably be just a political document…It reads very pro-industry, especially in the area of unintended effects. The Division of Food Chemistry and Technology recommended that the FDA test every GM food before it enters the marketplace. They never did any testing. Instead, they threw the ball back into the biotech company’s court and relied on companies like Monsanto and Dow to prove that such foods were safe. How did this happen? Well, it’s easy when the man placed in charge of the FDA, Michael Taylor, was Monsanto’s former attorney and later, their Vice-President. All FDA conclusions regarding the safety of GMO foods are based on superficial, biased data and manipulated research. How trustworthy is a company like Monsanto? Responsible for Agent Orange, hiding PCB pollution, and now Glyphosate (RoundUp) pesticide and genetically engineered foods? Well, they’re bad enough that two million people from 52 countries in 436 cities marched in protest against them last Saturday, May 25th. This is the biggest demonstration of protest against a single company in our history! 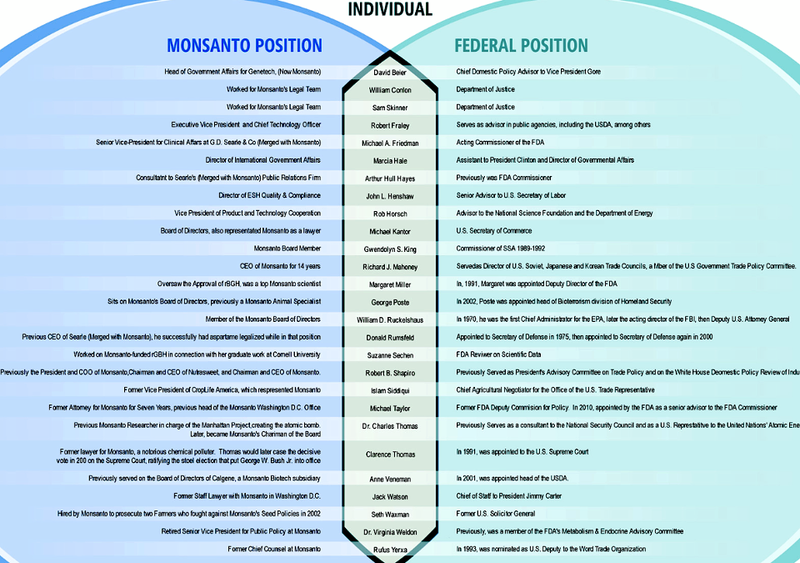 We truly have a revolving door between the government officials sworn to protect us through various protective agencies (FDA, EPA, USDA, etc.). A true boycott is the only way we can really generate the consumer tipping point needed to remedy our food supply. Well, there are a whole range of independent studies that have been performed around the world that correlate many health problems with the consumption of GMO foods. They have been linked with potential causation to cancers and other auto-immune diseases, food allergies, various G.I. problems, Autism, ADHD, gut dysbiosis, and worse. 1. Poison drinkers: RoundUp Ready soy, corn, etc. with genetically engineered herbicide tolerance. Poison drinker crops are able to withstand increasing amounts of herbicide applications. However, they’ve left us scratching our heads due to herbicide resistant weeds and numerous health problems – including increased pesticide residue on our foods. 2. Poison producers: BT Corn and cotton with genetically inserted BT toxin pesticide producers. These GMO crops are gifted with the ability to produce BT toxin right within every cell of the plant they’re transferred to. Although the EPA/FDA believe these foods are safe, because they claim it’s impossible for BT toxin to randomly mutate within our digestive tract. However this assumption is founded on Monsanto’s research. 3. Virus-based: Yellow squash, zucchini, and Hawaiian Papaya are genetically engineered by inserting target transgenes into a virus, which infiltrates the cells and possesses the potential for random and unexpected mutation. Did you know that most of the corn grown in the U.S. is GMO BT corn, a poison producer? This has the BT toxin gene inserted into every cell of a plant – you can’t wash it off – there is no way around consuming it. It’s even regulated by the EPA! However, the FDA considers it substantially equivalent to conventional corn. Studies have proven that BT toxin, which is expected to be destroyed during its travels through the human digestive tract, may instead survive and be detected in human blood – it’s even been detected within the blood of unborn fetuses! It’s quite possible that it adversely affects human DNA, resulting in a problematic imbalance within the gut that contributes to a wide range of serious conditions or worse. Pro-GMO critics have been hard at work trying to discredit Seralini’s study that proves GMOs may cause serious harm through consumption. This, my friends, is why I am so compelled to write about this subject. I feel this betrayal deep within my bones and I want our legislators to do what is right for our world’s health. How dare they approve untested foods and medicines – and then not even tell us about it! If my Fairy Godmother popped up and offered me a wish right now, I swear I’d ban GMOs from the entire planet. Penny for your thoughts on these matters?! Leave me a comment! How Can We Get Rid of GMOs in our Food Supply? First, we must become educated on the issue. Next, we generate increased awareness within our own circles of friendship and boycott GMO containing products and companies that contribute funding to thwart the legislation of labeling initiatives. We vote for progress with each trip to the supermarket through the choices we make for our family’s dinners. We make noise about the issue and continue to stay connected to remain aware of important calls to action. When we band together, we help to create a consumer tipping point that forces profitable food manufacturers to commit to eliminating GMO ingredients throughout their food products. This momentum, creates a cascading movement for more and more food producers to source non-GMO ingredients to meet our growing consumer demand. This issue is far too big for our government to remedy alone. It’s up to us to show them exactly how serious we are about these matters! Visit Mom’s Across America March to learn how you can get involved with change today! Watch the abridged version of Jeffrey Smith’s Genetic Roulette. Download a free Non-GMO shopping guide. Watch the recent coverage of last Saturday’s March Against Monsanto as reported on CNN. Read more about a popular food that may encourage pesticide production within your gut. Check out an endless listing of informative articles, presentations, flyers, and even sample letters you can use to reach out against GMO foods. Thank you so much for your encouraging praise! I’m passionate about the subjects I write about and hope that my words may help others to consider some harsh realities present in our world today. By spreading awareness and understanding, I’m hoping we can shape a better, safer world together! Take care!